4" x 4" 5" x 5" 6" x 6" 8" x 8"
Vinyl fences are a durable, nearly maintenance-free alternative to wood and metal fences. When estimating the material needed for a vinyl fence, it is important to first select the style of fence and type of panel you want. They are available in a wide variety of styles, so you can get nearly any look you want. Structurally, vinyl fences are based on the same post, rails, and picket system as wood and metal fences. The difference is that vinyl fences come in pre-built panels that are installed between the posts using brackets. Some come as components that snap into pre-routed holes and slots which must be put together on site. Because each manufacturer has their own connection system, panel systems require specially constructed posts. Those and post caps are often sold separately from the panels. 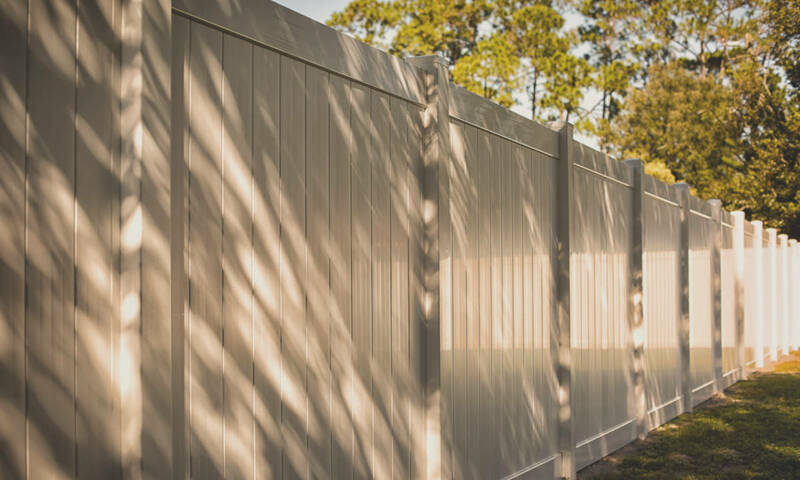 Finding the number of panels needed for a vinyl fence installation is a pretty simple process, but you need to know the length of the panel you’re using first and the length of each section of fence between each corner. The general process will be to find the number of panels needed for each section of fence, and then add the total for each section together to find the total number of panels. The number of panels in a section is equal to the length of the section in inches minus the width of the post divided by the length of the panel in inches plus the post dimension. For example, let’s find the number of panels for a 100′ stretch of fence using 8′ panels and 5″ x 5″ posts. Before estimating the number of vinyl fence posts for your installation, determine the number of ends and corners you will need. Vinyl fence posts come in 3 different types, end posts to use at the end of the fence, corner posts for joining fence panels at a 90° angle, and line posts for joining fence panels at 180°. You will need 1 corner post for each corner of the fence and 1 end post for each end of the fence. Once you know the number of ends you need and the number of corners, the final step is to find the number of line posts needed. The number of posts is generally equal to the number of panels plus 1 for the end. This is because every panel will connect to a post and then add a post to connect the next section. The final post will need an end post, which is why the extra post is added. To find the number of line posts, subtract the number of corner posts and end posts from the panels + 1 measurement. For example, let’s find the number of posts for a fence with 12 panels, 1 corner, and 2 ends. It’s important to note that a vinyl post cap will be needed for each post, and they are usually sold separately. In our example we would need to order 13 post caps in addition to the posts. Vinyl fence materials range in price based on the style of fence, height of the fence, and quality of materials. The average 6′ vinyl privacy fence costs $25-$35 per ft2. Get an estimate for your fence installation from a local installation pro. If you know how much material you need you can easily estimate the price of a vinyl fence. One option to get a material price estimate is to get a quote from a home center or supplier based on your materials. Another option is to find the price of each style of post, post caps, and panels. Multiply each price by the quantity needed, then add together to find the total cost of materials. Are you installing a wood fence, see our fence calculator to learn more. Next Step – After estimating materials it’s time to begin laying things out. Learn how to lay out a fence safely and efficiently, including how to avoid buried utilities, center your posts and panels, and get perfectly square corners. Project difficulty: can be challenging. On a scale of 1 to 5, the difficulty level is 3/5. Time required: a couple days. On a scale of 1 to 5, the time required is 4/5. Project cost: costly. On a scale of 1 to 5, the cost level is 4/5. Get all the information you need to plan your fence installation project. Learn how to choose the right fence style for your property and within your budget. Learn the key factors in choosing the right fence. Are You Planning a Fence Project? Get hassle-free estimates from local fence professionals and find out how much your project will cost. See 15 popular fence styles to get inspiration for your fencing project. See several privacy, picket, and estate fence styles and popular picket styles. How Much Does a Fence Cost in 2019? Find out how much it costs to install a fence. Costs vary by style and material, and other factors affect price such as labor and a gate installation.